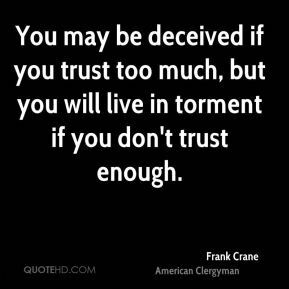 Never trust anyone completely but God. 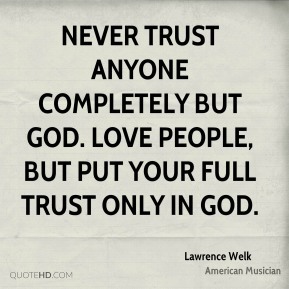 Love people, but put your full trust only in God. 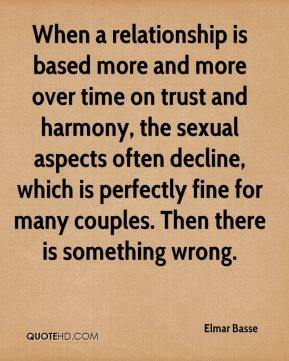 When a relationship is based more and more over time on trust and harmony, the sexual aspects often decline, which is perfectly fine for many couples. Then there is something wrong. 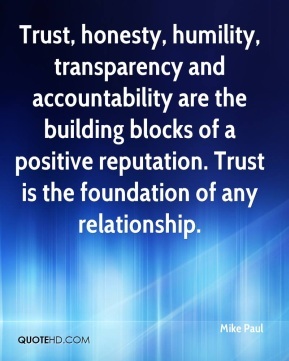 Trust, honesty, humility, transparency and accountability are the building blocks of a positive reputation. 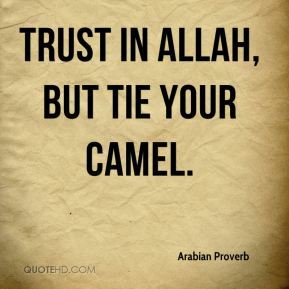 Trust is the foundation of any relationship. 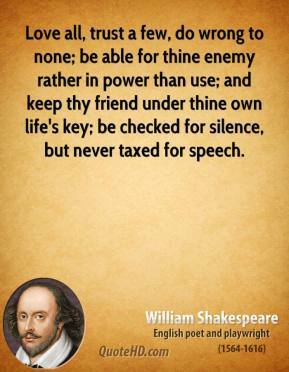 Love all, trust a few, do wrong to none; be able for thine enemy rather in power than use; and keep thy friend under thine own life's key; be checked for silence, but never taxed for speech. This decision says that quality should be more important than political connections. 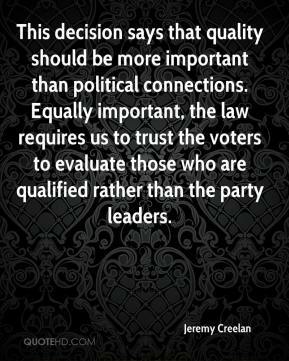 Equally important, the law requires us to trust the voters to evaluate those who are qualified rather than the party leaders. 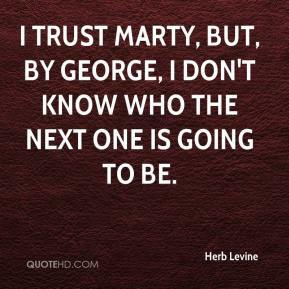 I trust Marty, but, by George, I don't know who the next one is going to be. 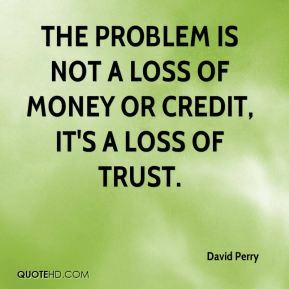 The problem is not a loss of money or credit, it's a loss of trust. Coach has faith in me. I knew he was a great coach. 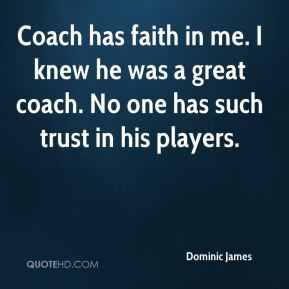 No one has such trust in his players. 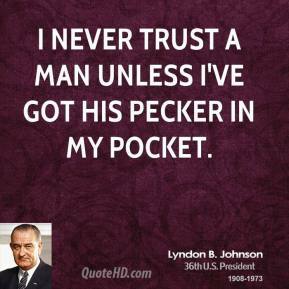 It's difficult to look at the market with one eye and the war with the other, as you don't trust what you see. 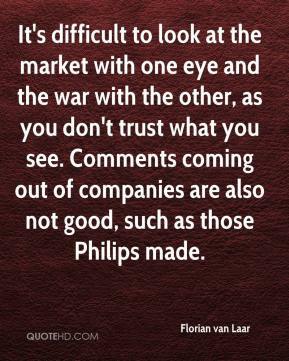 Comments coming out of companies are also not good, such as those Philips made. 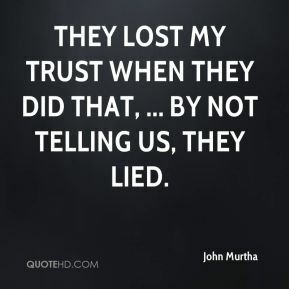 They lost my trust when they did that, ... By not telling us, they lied. May today be peace within. May you trust your highest power that you are exactly where you are meant to be... May you not forget the infinite possibilities that are born of faith. 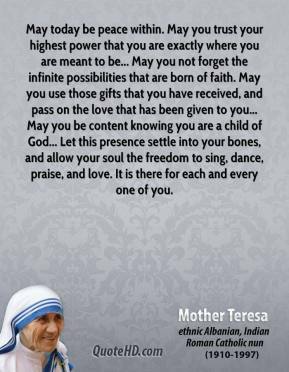 May you use those gifts that you have received, and pass on the love that has been given to you... May you be content knowing you are a child of God... Let this presence settle into your bones, and allow your soul the freedom to sing, dance, praise, and love. It is there for each and every one of you. Knowledge is gained by learning; trust by doubt; skill by practice; and love by love. 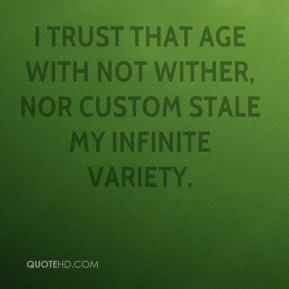 I trust that age with not wither, nor custom stale my infinite variety. 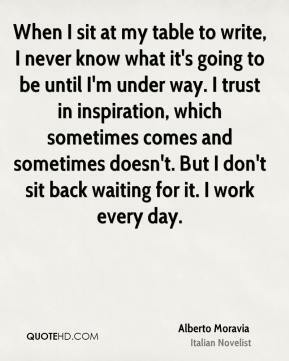 When I sit at my table to write, I never know what it's going to be until I'm under way. I trust in inspiration, which sometimes comes and sometimes doesn't. But I don't sit back waiting for it. I work every day. It's a very brave thing to fall in love. 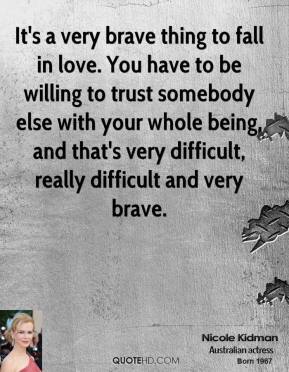 You have to be willing to trust somebody else with your whole being, and that's very difficult, really difficult and very brave. 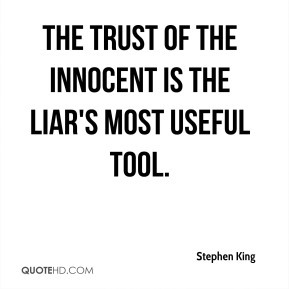 For it is mutual trust, even more than mutual interest that holds human associations together. Our friends seldom profit us but they make us feel safe. 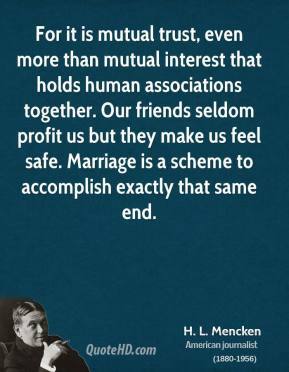 Marriage is a scheme to accomplish exactly that same end. 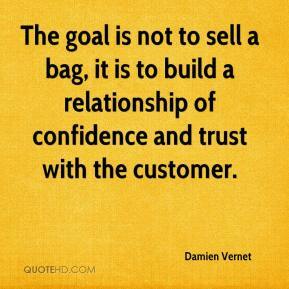 The goal is not to sell a bag, it is to build a relationship of confidence and trust with the customer. 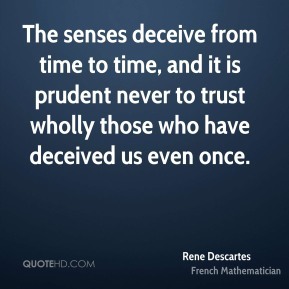 While day by day the overzealous student stores up facts for future use, he who has learned to trust nature finds need for ever fewer external directions. 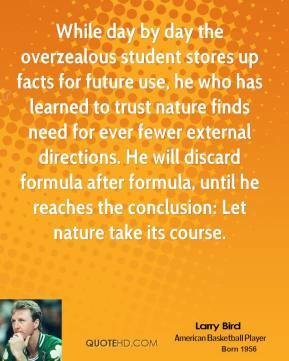 He will discard formula after formula, until he reaches the conclusion: Let nature take its course. Trust in yourself. 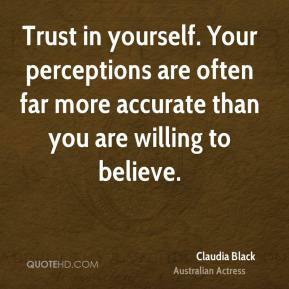 Your perceptions are often far more accurate than you are willing to believe.